‘Atal Pension Yojana’ is another new scheme launched by our Finance Minister Arun Jaitley in union budget. What are the eligibility criteria for this scheme? How to avail the scheme? What is premium to be paid for this scheme? All the answers are answered below. Have a look at it. 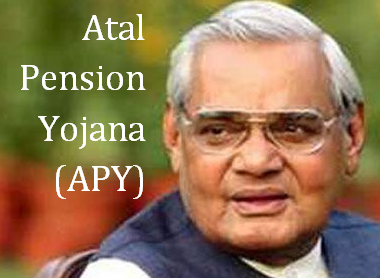 Atal Pension Yojana is named from the Ex Prime Minister and Bharat Ratna Atal Bihari Vajpayee. The aim of ‘Atal Pension Yojana’ is to provide definite pension. It means that if you want 3000 Rs. 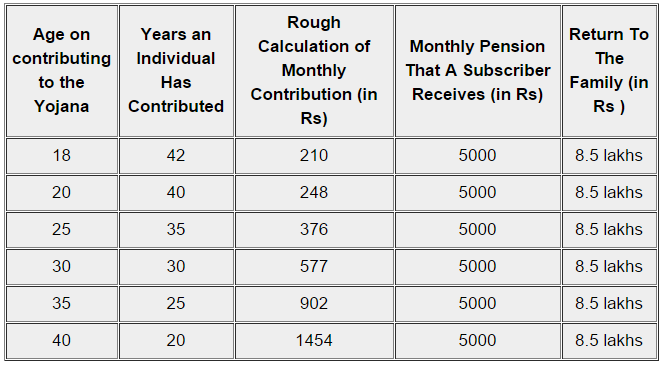 per month as a pension after your retirement then you need to contribute accordingly. The aim of this scheme is to provide pension to unorganized sector workers. Eligibility to get the scheme is given below. You can only avail the scheme if your age is between 18 to 40 years. Moreover, the member of any statutory social security scheme will not get this scheme. To get the scheme you need to have bank account and Aadhar Card. Link your Aadhar Card with your bank account. After that, fill up the application form and submit it. Furthermore, fill up and submit the application form every year before 1st June for the renewal of the scheme. Download application form from official website or you can get application form from Bank itself, Just fill that application form and submit it. (you can get and fill application form in your local language). Provide your Aadhar card number (with photocopy). Note:- Please keep minimum balance in your bank account, as Atal pension yojana's monthly premium will be directly Auto-debited from your bank account, every month. To pay the premium there is only one payment mode. The premium will be auto-debited from your bank account directly every month. The premium payable for this scheme is given below age-wise. As you can see in this table, you need to calculate your pension according to your age and years of contribution for this scheme. If you join this scheme at the age of 18 then you need to pay between 42 and 210 Rs. per month. A person will get 5000 Rs. of monthly pension. The ‘Atal Pension Yojana’ focuses for the workers of the unorganized sector or small scale sector. They must opt for Atal Pension Yojana to get the benefit of pension after their retirement. Moreover, the contribution of government in this scheme will be 50% of the premium. However, the limit for the contribution of government has decided to pay Rs. 1000. 1. What is last date to apply for APY Pension Scheme? There is no last date, it’s a pension scheme by Government of india, in which you need to Contribute 50% amount (other 50% amount will be paid by Government of india) and at the age of 60 years, you can get Rs.1000 to Rs.5000/- of monthly pension. 2. Can Students join in Atal Pension Yojana? Yes, since they are not covered in Jan Suraksha Scheme, they can start contribution in APY Pension Scheme. 3. Can National Pension Scheme subscribers join APY? 4. 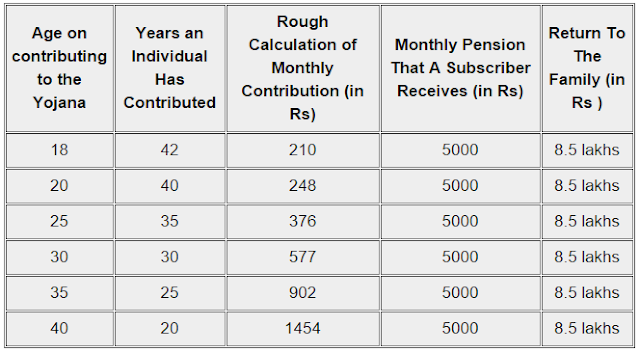 Can Tax Payer join Atal Pension Yojana? Yes, they can. But they can not avail the benefits of 50% contribution from government. It is clearly mentioned that this scheme is for NON-Tax payer only. If you are tax payer then you need to pay full payment of Pension premium. 5. Bank account is compulsory needed to get benefits of APY? Yes, since government is also going to contribute 50% in this scheme, they will be added in your bank account (+ your contribution). This way, your full premium will be paid to bank and you can avail benefits. 6. Is it compulsory to fill Nomination in Atal Pension Scheme? Yes, you need to provide Aadhaar card of your nomination, so in case you are not avail the benefits of APY, your nomination will get benefits. 7. I started with contributing Rs.1000 per month, now i want to increase the monthly contribution in APY scheme, can i? Of course, you can increase your monthly contribution in APY Any time. Just go to your bank and inform them about that you want to increase your pension premium amount, they will help you out. 8. How can i check status of APY application? One will get SMS right after his/her application is approved, on the registered mobile number. 9. What if another government came in power, they will discontinue this pension scheme and we will lost all money? No, you can not lose money. This is Government of India's pension scheme. Which is cleared and passed by all official rules keep in mind. parliament of India has passed this scheme in budget session. So, no other party can discontinue it. All they can do is just Change the name of of pension scheme. 10. Is Atal Pension Plan is Tax Exempted? Yes, it is. Certainly, but recently PFRDA (Pension Fund Regulatory and Development) has raised concern that "Tax treatment of Atal pension is not clearly known but we understand it will be at par with the existing National Pension Scheme (NPS)". Government is yet to answer on this, we will update you soon. If you want to apply for Atal Pension Yojana, Just download application form official website, go to nearest bank with require documents, and open your pension account for free. below is application form download link for atal pension yojana. 3. Download APY Application Form in Gujarati. To download Atal pension scheme application form in more language, do visit official website at http://jansuraksha.gov.in/forms.aspx now. The application form also available in Bangla, Marathi, Kannada, Odia, Tamil, Telugu. Update :- Government of india has made some changes in AtalPension Yojana. After getting several suggestions, Finance minister has today posted on facebook that they made some changes in this pension scheme, below is list of changes. 1. Now subscriber can pay on monthly, quarterly, half yearly basis to Atal Pension Yojana. 2. The account will not be deactivated and closed till the account balance with self-contributions minus the Government co-contributions becomes zero due to deduction of account maintenance charges and fees. 3. Penalty on delayed payment has been simplified to Rs. One (1) per month for contribution of Rs. 100, or part thereof, for each delayed monthly payment instead of different slabs given earlier. 6. The Government co-contribution, and the interest earned on the Government co-contribution, shall not be returned to such subscribers. Source of new updates on Atal pension yojana is official facebook page of Ministry of Finance, Government of India. Update :- (22nd March, 2016), Finance ministry has announced that now in case of death of subscriber, "Spouse" of subscriber will be allowed to Continue contributing in APY account till 60 years of age of subscriber. (currently the rule says that lump sum amount will be paid to spouse in case of premature death of Subscriber. And the Spouse will be receiving the same amount of pension in APY. And after death of subscriber and spouse, "nominee" will receive the pension wealth. Update:- More then 10cr+ people of india has taken benefit of Atal Pension Yojana, So far. Fill up the form as soon as possible to avail the scheme. Also check Pradhan Mantri Jeevan Jyoti Bima Yojana and Pradhan Mantri Suraksha Bima Yojana.